Welcome to 569 SELKIRK LN in Maple Leaf Golf & Country Club. This 2005 Jacobsen built double-wide manufactured home is located on the back east side of the community. Spacious 1272 square foot home located on 5202 sq ft perimeter lot. Very quiet location. Perfect place to retire or enjoy all year long. New AC in Sept 2017. Interior floor plan includes kitchen with granite counter tops & breakfast bar dining room large living room guest bedroom guest bathroom with tub/shower combination master bedroom master bath with walk-in shower and interior laundry room. Laminate floors in bedrooms and living room ceramic tile floors in kitchen dining room and bathrooms. Exterior includes open air front porch enclosed lanai on right side which offers you an extension to your living space and a large storage shed on the back with room for a workshop. Long paver stone driveway with covered parking. Green space to the right will never be built on. 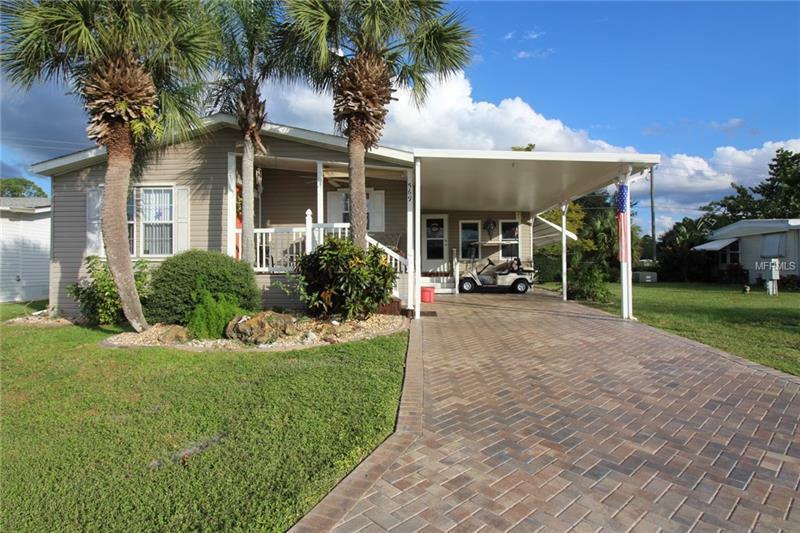 Located in a resident owned 55+ gated golf course community with an active resort lifestyle. Features 75+ clubs/activities including a Par 62 golf course 5 tennis courts bocce ball lawn bowling 2 shuffleboard courts 4 heated swimming pools 2 hot tubs fitness facility woodworking facility 2 pickleball courts restaurant with full service bar and much more. Home prices INCLUDE $40000 membership certificate/share. One dog allowed at this perimeter lot location. Shown by appointment only. Sold furnished. NO Golf Cart.